The mission of the local church is to reproduce itself. This involves reproducing other churches near and far (Ac 1.8). These plants should be doctrinal (2Ti 1.13–14) and philosophical (1Ti 3.14–15) reflection of the mother church. The heresy of Hyper-calvinism destroyed the focus of this vision in the 1700s. Hence the Baptists lost many churches during this period of decline. It was also during this time that God was pleased to raise up some men who were devoted to the mission of the church. Two such men were Andrew Fuller and William Carey. These men did not invent a new doctrine to revive the church. Rather, they relied on Scripture and reasoned in a biblical manner. At the age of sixteen, he witnessed a baptismal service (March 1770). Through this example and the teachings of Scripture, he was baptized a month later. By the next year he was preaching in a church in Soham. Though he “durst not” preach the gospel to sinners. All that changed in 1775 when he came across a pamphlet which opposed Hyper-Calvinism. This pamphlet and the Scriptural examples of Christ showed him that he needed to “address the gospel to sinners and invite them to believe.”3 Fuller called Hyper-Calvinism “False Calvinism.” and rightly so. In those harsh days, it was common for children to die in infancy. Of his eleven children, only three survived. His wife also died after giving birth August 23, 1792. In spite of his recent widowing, he along with thirteen other pastors formed the first Baptist missionary society. He was elected secretary and traveled all of England, five times to Scotland and once to Ireland – he was not paid for his services. 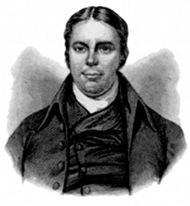 Andrew Fuller was a Modified Calvinist. That is, he believed in the five doctrines of Calvinism. He explained Limited Atonement as “Christ’s death was sufficient for all but efficient for only the elect.” He found himself strangely labeled an Arminian by the Hyper-Calvinists and Hyper-Calvinistic by the Arminians. Modified Calvinists became known as Fullerists. The writings of Jonathan Edwards helped Fuller understand how divine sovereignty and human responsibility did not contradict. As he worked through his own theology, he refrained from publishing for a long time. The theology of the Hyper-Calvinists was popular and their logic persuasive. Eventually, he published his book The Gospel Worthy of All Acceptation. He expected controversy and received it from both the Arminian and Hyper-Calvinist camps. Unconverted sinners are commanded, exhorted, and invited to believe in Christ for salvation. Everyone is bound to receive what God reveals. The gospel, though a message of pure grace, requires the obedient response of faith. The lack of faith is a heinous sin which is ascribed in the Scriptures to human depravity. God has threatened and inflicted the most awful punishments on sinners for their not believing on the Lord Jesus Christ. The Bible requires of all persons certain spiritual exercises which are represented as their duty. These include repentance and faith no less than the requirement to love God, fear God, and glorify God. That no one can accomplish these things apart from the bestowal of the Holy Spirit is clear. Nonetheless the obligation remains. In this respect man’s duty and God’s gift are the same thing, seen from different perspectives. Carey was born August 17, 1761, the son of Edmund and Polly Carey. Carey’s uncle Peter was more of a father to him than his own father. Peter served with the British army, undoubtedly having participated in the British/Indian war. He told young Carey of adventures on the sea, in Africa, the New World, and India. Carey was a diligent young man. He taught himself Latin at the age of 12. Not afraid of work, he cobbled shoes until he was 28. The young cobbler also taught himself to read his coworker’s Greek New Testament. Later Carey would learn Hebrew and teach himself Dutch and French. These languages were learned. A fellow cobbler lent him books and witnessed to him in the shop. Even though Carey would often win the debates, he realized the truth of his situation. He was a sinner in desperate need. By this man’s witness, as well talks with other believers, Carey was saved. At the age of 19, Carey married Dorothy Plackett, who at the ripe old age of 24 was about to be declared a “spinster.”6 The marriage began with many difficulties. Their firstborn, Ann, died when she was 2 years old. The same fever that killed their daughter almost took Carey’s life, leaving him bald for the remainder of his life. Carey’s sister was widowed at about the same time, leaving Carey responsible for her well-being and the well being of her four children. Given all of the difficulties, Carey continued to pursue a life-long study of God’s Word. Having been persuaded by the preaching of Hebrews 13:13 by Thomas , Carey became a Dissenter. Quite a move for Carey, for before his own salvation, Carey had thought of destroying the building in which where the dissenters met. 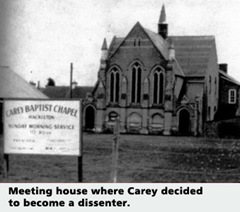 Though a Dissenter, Carey was not yet a Baptist. He listened to the preaching of those who practiced infant baptism, yet was not convinced. He did take it upon himself to study the subject. He learned that baptism follows salvation and is properly administrated by immersion, not by pouring or sprinkling. He asked Pastor John Ryland to baptize him. Carey was baptized October 1783. 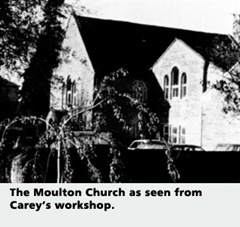 Carey’s giftedness for preaching was recognized by a group of Baptist believers in Moulton. There he served the church making a mere 12 pounds a year which was enlarged with the addition of 5 more from the Particular Baptist Fund. Carey’s married life in Moulton was enhanced by the arrival of three boys – Felix, William, and Peter. Despite the low salary and loss of their firstborn, Moulton was close to home for Dorothy. Carey particularly enjoyed reading the newly published Journal of Captain Cook’s Last Voyage. In his words, “it was the first thing that engaged my mind in missions.” His fascination with the world’s situation was so great he constructed a map in his workshop, compiling facts on populations, religions, and various other facts of each country. Those facts appear in his Enquiry. More is to be said about that below. The Moulton ministry was demanding. To support his family, Carey had to teach school and cobble shoes. A deacon from Andrew Fuller’s church employed Carey to make boots for the British army. This boosted Carey’s income as well as work load. The deacon was a wealthy man who became interested in Carey’s remarkable abilities in the original languages (Greek and Hebrew). He encouraged Carey to end his shoe making and wholeheartedly devote his energies to the language studies. This deacon gifted Carey 10 shillings a week to make up for the loss. Another man by the name of Thomas Potts gave Carey money to publish his Enquiry so that it could be disseminated throughout the country. Carey was pursued by the Baptist Church at Harvey Lane in Leicester. This was a city church which offered an increase in income. After a heart-rending decision, Carey accepted the call. The Carey family once again expanded with the blessed arrival of a girl they named Lucy. The ministry in Leicester was a great challenge. The church was “meat grinder” for pastors. It had “just gone through three pastors in as many years.” The church was so divided that Carey threw himself upon the grace of God. He led the congregation to dissolve itself and recharter its ministry. That meant everyone had to go through the membership process once again. Those who were not committed to spoiling the ministry did not bother reentering the membership process. They lost some members, but the church experienced a revival. It was not long before they had to build on to the church to accommodate the crowds. But all was not a “bed of roses” at Leicester, Carey suffered another personal tragedy. His daughter Lucy did not survive to see her second birthday. On Monday I confine myself to the study of the learned languages, and oblige myself to translate something. On Tuesday, to the study of science, history, composition, etc. On Wednesday I preach a lecture, and have been for more than twelve months on the book of Revelation. On Thursday I visit my friends. Friday and Saturday are spent in preparing for the Lord’s day; and the Lord’s day, in preaching the word of God. Once a fortnight (every two weeks) I preach three times at home; and once a fortnight I go to a neighbouring village in the evening. Once a month I go to another village on the Tuesday evening. My school begins at nine o’clock in the morning and continues till four o’clock in winter, and five in summer. I have acted for this twelve month as secretary to the committee of dissenters; and am now to be regularly appointed to that office, with a salary. Add to this, occasional journeys, ministers, meetings, etc.’ and you will rather wonder that I have any time, than that I have so little. This situation at Leicester was such that Carey was not formally installed as pastor until nearly two full years had passed. 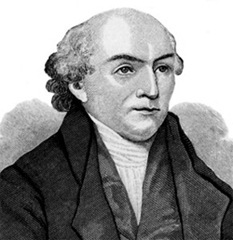 On April, 1791, Carey was officially made pastor of the church. That evening Carey read portions of his unfinished Enquiry and Andrew Fuller preached “The Danger of Delay” a forceful message summoning his fellow pastors to evangelize the world. Though many pastors remained unmoved, the message apparently impacted some pastors to encourage Carey to finish and publish his Enquiry. One. The Great Commission Hyper-calvinists were teaching that the Great Commission was for only the disciples during the time of Christ. Carey exposes the fallacy of this understanding with the following arguments. First, he appealed to their inconsistency. The practice of baptism is found in the same commission. Second, he appealed to the ordinary practice of giving the gospel. If the great commission was only for the apostles, then everyone who gives the gospel errs. Third, he appeals to the clarity of Scripture. Matthew 28.20 specifically states that the gospel must go “to the end of the world.” Throughout the remainder of this unit, Carey soundly defeats various other Hyperist excuses for taking personal responsibility in delivering the gospel to the heathen. Three. A World Survey Carey produced page after page of factual data he collected over the years from notes of his handstitched leather globe. After the survey, he states “All these things are loud calls to Christians, and especially to ministers, to exert themselves to the utmost in their several spheres of action, and to try to enlarge them as much as possible. Five. Our Duty In this section, Carey answers the question “what means out to be used, in order to promote this work?” The first, and foremost duty, is that of “fervent and united prayer.” It was Carey’s practice to engage his church in monthly prayer meetings for the lost. He devotes more than half the words of this unity to the matter of prayer. Secondly, he opines that a missionary society be formed to employ missionaries and secure financial resources. The society would also review the progress of the missionaries to make sure they were not “settling in a place where temporal gain invited them, than of preaching to the poor Indians.” He further proposed that this society be made up of those in the “particular Baptist denomination.” He was aware that if groups (with differences of theology and practice) were intermingled, “it is likely their private discords might throw a damp upon their spirits, and much retard their public usefulness.” He then gives examples of how the wealthy, the middle-class, and those few means would be able to financially support the mission society. Andrew Fuller organized a meeting for October 2, 1792 at the home of a Mrs. Beeby Wallis. It should not be overlooked that Fuller was a man of great devotion to his Lord. He led this meeting only little over a month since his wife died. Fourteen men met in the parlor. They were young (ranging in age from 26–40), unknown, and with very little financial resources. Their churches were small, located in small hamlets. Fuller was appointed as secretary. 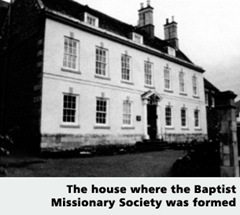 A treasurer was appointed and three others, including Carey, comprised the leadership of the newly formed Particular Baptist Society for the Propagation of the Gospel Amongst the Heathen. 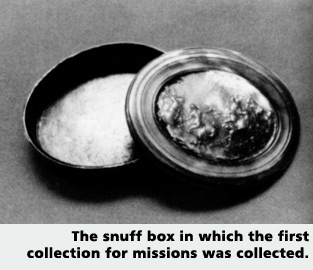 An offering was collected and placed in a snuff box. They collected that week’s proceeds from the sale of the Enquiry equaling a small sum of 13 pounds, 2 shillings, and 6 pence (from proceeds collected that week from The Enquiry). One month later, rumors were circulated that Carey was being considered as their first missionary to Sierra Leone, Africa. Mission work seemed out of the question for Carey. His church in Leicester was beyond the troubles of the past and growing steadily. His wife had never traveled beyond the county in which she was born. His wife was expecting another child. Nevertheless, these were rumors. The Society secured the name of Dr. John Thomas. He had been to India twice, once as a surgeon and once as a missionary. Dr. Thomas was known to be a man of great character although he had accumulated a considerable debt. 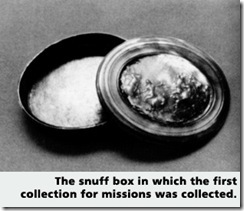 The Society overlooked this issue and appointed him as a missionary. They also asked Carey if he would serve as Thomas’ associate. Carey enthusiastically agreed without hesitation. What about Mrs. Carey? What would she say? She didn’t like it at all. Matter of fact, she refused to go. Did it have much to do with the fact that she was due only a month before Carey would board the ship to India? Was it that she had never been away from home and considered Carey to be going insane? Maybe. It is difficult to say what would cause Mrs. Carey to have such strong resolve not to attend her husband in India. Nevertheless, she firmly refused to go. Only after William persistently pled with her would she let her oldest son go with him. Dr. Thomas, Carey, his son Felix and a few others boarded the ship April 4. France declared war on Great Britain making the waters too dangerous to traverse. For six weeks, the ship had to dock on the Isle of Wight. Carey received a letter from Dorothy stating that all is well after the birth of their son. Dr. Thomas’ indebtedness caught up with him. His creditors found he was on the ship. Events were such that Dr. Thomas, Carey, and his son were forced off the ship. The others were allowed to continue to India. Having to secure another way, they went back to London. While there, Carey tried again to convince his wife to go. He failed. However, Dr. Thomas influenced Dorothy to go. Once she was boarded, she changed her mind, but it was too late. For years, Carey did not see any come to know Christ. It was a difficult field, more difficult than Carey had imagined. The Indians feared conversion for it meant total outcast from everything they knew. 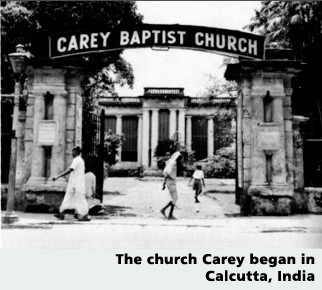 It took Carey a few years to develop an understanding of their culture and fears so he could reach these Indians for Christ. India is a land of a “thousand languages.” There were no Bibles in their language. Carey’s language learning abilities allowed him to produce many translations in their own language. 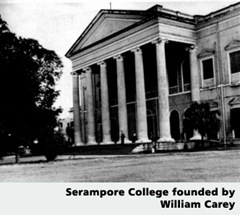 Later, Carey moved to Serampore and founded the Serampore Mission which engaged in producing translations of the Bible. One may wonder, “How did mission work in India help turnaround the Hyper-Calvinism in London?” As Fuller and others traveled throughout London, they preached on missions. 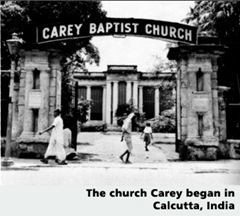 Missions magazines were distributed throughout the country (including America) publishing the news of the Carey’s mission work in India. The work of missions so convicted the Londoners that three societies were established to reach the “untouched” areas of Britain. Within five years, the membership of some congregations tripled and churches were established. This carried into the next century in England. The Sunday School was founded, more publications were developed, new schools were established, and the work of foreign missions enlarged. 1 George, Faithful Witness, p. 49. .Fuller 2:343–66. Cited by George, Faithful Witness, pp. 56–7. 6 In those days, girls usually married at the age of 12, boys when they were 14. ”From Eustace Carey’s work Memoir of William Carey, p. 37. Quoted by Timothy George, Faithful Witness, p. 20. ”George, Faithful Witness, p. 27. .Carey to his father, Leicester, November 12, 1790. Cited from George, Faithful Witness, pp. 26f. ”by George Smith in his The Life of William Carey (1887). Cited in Faithful Witness, p. 31. .John Sutcliff, a friend of Carey, actually encouraged the churches involved in the Northamptonshire Association to make it their practice to devote the first Monday of every month to prayer. ”This phrase is often restated as Expect great things from God. Attempt great things for God. Though Carey would not disagree, these were embellishes. These additions have been attributed to John Ryland in an account he wrote 25 years later. See George, Faithful Witness, p. 32. .Ivimey, A History of the English Baptists, IV, 68–75. Cited by Torbet, History, p. 83.